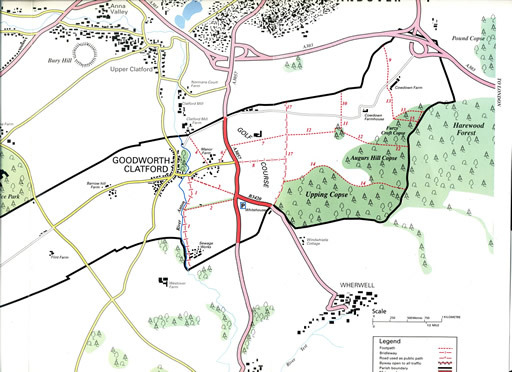 The Village Design Statement is based upon the opinions of the residents of Goodworth Clatford expressed at public meetings, including a workshop, and drawn together by the Village Design Group. It highlights those aspects of the village and surrounding countryside that are considered important and most valued by its residents. The aim is to ensure that further development and change are in keeping with the village's past and with the wishes of those who live in Goodworth Clatford today and are entrusted with its future. The local planning authority and the Parish Council have supported the Village Design Group and have been informed of progress at each stage. It is hoped that this Statement will be adopted by Test Valley Borough Council as Supplementary Planning Guidance and its recommendations will be taken into account when planning applications are assessed. The statement attempts to define the distinctiveness of the village and surrounding area. History has shaped the village and the land to give an attractive blend of dwellings and countryside. The centre of the village with the River Anton at its heart is a designated Conservation Area. There are hopes that this may be extended to include other important landmarks in the village, like the old water tower. There are no large commercial developments and the open countryside which surrounds the village is much treasured by residents and visitors alike. An active programme of tree replanting and wildlife preservation has helped to retain the unspoilt character of the village. The river with its water meadows, the many mature trees and the backdrop of Harewood Forest give Goodworth Clatford a distinctly rural atmosphere. Why Goodworth Clatford? The original Saxon pagan settlement by the river was known as 'Goda's Enclosure'. In the Domesday Survey of 1086 the area is recorded as Godorde and by 1538 the church register is Goodworth Clatford. For centuries the village was a self-contained farming community with its water meadows, good grazing land and arable fields sheltered by a gentle rolling landscape. Up until the 1939-45 war the general character and shape of the village changed little. To the east was Church Lane with St Peter's dating from the 12th century, a large rectory with its Glebe Farm running to the Anton, and Manor Farm. The narrow western lane to Barrow Hill serviced the farm and farm cottages. The village street and cross roads formed the hub of the community and the lives of most villagers were shaped by the needs of the land and the trades which supported it. With horses used for work and transport the forge was an important landmark in the street. Two shops were kept busy, the Post Office did its own sorting and delivery, two builders provided a variety of trades for men and boys (leaving school at 14 until 1934) and the larger village houses employed young women as domestic staff. Socially it was a self-contained environment. Cricket was played on Glebe land down by the river, the Village Club built in 1923 by Sir Alfred Yarrow offered dancing, a reading room, billiard room and tennis courts. In 1935 Mr Lloyd of Flint House gave land for the Recreation Ground to celebrate the Jubilee of King George V.
Rural life changed irrevocably with the outbreak of war in 1939. Young men went away, land girls worked on the farms, women made shells and a U.S. HQ was set up at Red Rice. Tragedy struck when a flying bomb demolished the Royal Oak, the school, the old forge and neighbouring cottages; less dramatic but important were the changed circumstances of the post-war era. Housing was needed and the first major change was additional local authority building at The Crescent on land compulsorily purchased from Yew Tree Farm. Andover became a London overspill town and with newcomers needing homes, building took place on the surrounding farm land. The end of petrol rationing and increase in car ownership made longer range commuting possible and 'live in a village and work in a town' became a new way of life. The closure of the 'Sprat and Winkle' railway line in 1964 also increased village dependency on the motor car. The larger developments of St Anne's Close, Burdock Close and Cottage Green were built in the l960s and 1970s in the south west quarter of the village. These, together with the bungalow developments along Church Lane and Barrow Hill changed the structural style of the village. Despite the changes to the rural character of the village and the loss of its farms and associated trades, the peaceful river and water meadows remain at its heart and, together with most of the Village Street, arc protected within the Goodworth Clatford Conservation Area. The village surroundings, its thriving replacement school, church, village shop and two public houses, the Village Club and proximity to larger centres have led to it being described as a 'most desirable village in which to live'. The new development of retirement homes in Church Lane bears this out. The challenge of the future is for the village to be able to accept further change without losing its essential character. The open spaces of this village form strong green links with its rural past and should be retained as an important feature in the life, and character of the village. The village, having developed gradually over many years, benefits from a rich mix of building styles and materials. Unusually, there is no major house or country estate to represent the grander style, nor any particularly large farm buildings or industrial structures. Being served first by canal, later by railway and now road transport, enabled a wider variety of materials to be introduced including brick, slate and clay tiles, these often being more durable than indigenous products. ​In the Village Street most houses arce of individual design, although there are two similar pairs of semi-detached cottages at each end. Also there are several terraces of cottages of similar design, but generally there is an intermingling of small and larger houses which complement one another and meet a variety of needs to sustain a thriving village community. A rich mix of building styles and materials gives the village character and adds to its visual appeal. Most early housing is of two storey construction, with only a few having attic rooms. 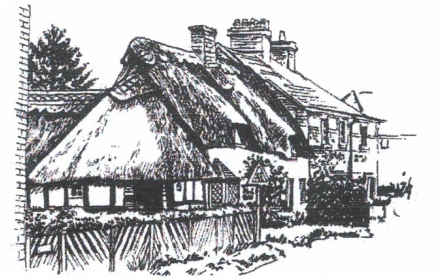 Generally roof lines are low with many of the thatched cottages having the characteristically low eaves which are a local feature. Pitches vary with material, thatch being the steepest, plain clay intermediate and slate, shallow. Many houses have eaves below first floor window tops, with 'eyebrow' style thatch and tile, semi-dormers, and half hipped roofs giving a low and open feel to the village. Early builders used locally available materials. Chalk, timber, flint and straw predominated and their use can be seen in some of the older houses and structures in the village. Timber framing, both exposed and clad, is obvious in many houses in Village Street including Queen Anne Cottage which is the oldest. The infill for panels, originally plaster on lathes, is now mostly brick. Chalk cob walling can be seen in a few places but its susceptibility to rain damage, particularly when the roof material is not maintained, has seen the demise of the Hampshire thatched wall, and the few remaining are now tiled. The use of flint on its own is unusual but combined with brick, especially in its attractive 'knapped' form, is widespread. Regrettably, much in the district has been painted over. Flint House in the Village Street remains a fine example of a Victorian version. From Victorian times, brick on its own became common, either natural or faced. Unusually, the four pairs of semi-detached cottages are of shuttered concrete construction, combining traditional cob construction techniques with newer materials. Although variation of colour can add variety to otherwise similar designs the subdued colours of the local materials reduce distant visibility. It is mainly in the village centre, where whitewash and cream rendered houses are concealed by the topography that brighter colours can be used without dominating the distant view. For roofing thatch is common on older cottages and is still well maintained, although no new thatched homes have been built in recent years. In contrast to the individuality of the earlier housing, the larger developments of the post war years have been constructed to uniform designs, the exception being the new courtyard development of terraced and cottage styles in brick and flint behind the Parish Church. Tiles are often concrete, bricks uniform non-local clays, and even street layouts have become uniform with houses carefully aligned. New housing should continue the variety of size, shape and style that has historically evolved. Roof-lines should be kept low to remain in proportion to existing properties. Window styles should be in keeping with local tradition and compatible with achieving low roof lines. Local brick, flint, clay tile and thatch should be used in new buildings to blend with the style of the village. The natural earth colours, greys of thatch, slate and flint and reds of bricks are a local characteristic. Well hosen modem materials can be used to reproduce local styles of building. Use of obvious prefabricated industrial building components should be avoided especially where prominent such as exterior joinery on the roof line and on visible elevations. Variety in detailed design, style and size for new developments of houses should be ensured. The position and orientation of houses should be varied to avoid uniform rows, and to allow sufficient space for screening by large mature trees. Goodworth Clatford is surrounded by an extensive area of open countryside, mostly fields and woodland, which creates separation both from other villages and from Andover. The parish stretches from the A303 trunk road in the north east out to Clatford Oakcuts in the west, with the village and most housing concentrated on the low ground in the centre of the parish along the valley of the River Anton. This separation from other communities, and the focus of the village around the river valley, encourages a sense of identity and community. This is reinforced by the absence of through traffic in the village centre. Major roads bypass the heart of the community with the A3057 running north to south at the east of the parish and the A303 running east to west touching only the northern extremity. The countryside surrounding the village was historically farmland and native woodland. In recent years alternative uses have been found for some of the agricultural land - for example conversion to a golf course and grazing for horses - but where this has been permitted it has involved limited building and little urbanisation, and importantly no street lighting. These uses have integrated with the continuing agriculture and have enabled the surrounding countryside to retain its rural character. This countryside provides extensive views, particularly of the higher ground of Harewood Forest to the east, and creates a strategic gap between the village and Upper Clatford, Andover and other communities. On the edge of the village, adjacent to the church, is an unusual wooden clad water tower standing in fields. 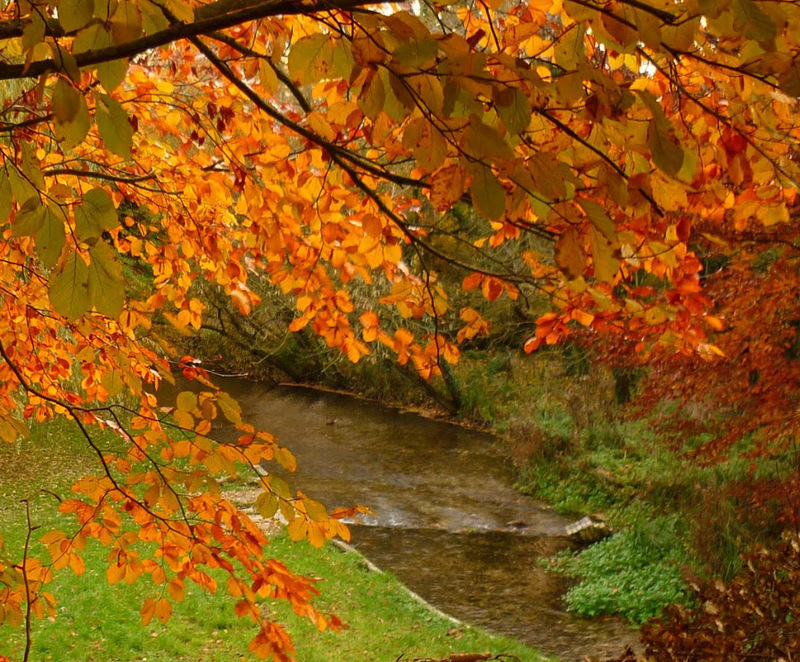 Within the village the River Anton provides a focus with attractive river banks and extensive water meadows. Important areas of open land within the village include the allotments above Cottage Green and The Park rising to the east of Sheep Wash. The setting of the majority of the village along the valley floor, and the screening provided by mature trees, means that it is hardly visible from any direction until close by. Even from the high ground of the A303 and Harewood Forest to the east the village is hidden and does not intrude into the rural landscape. Outside the core of the village itself there is limited residential development within the parish. One such area is the low density housing along the north side of Cowdown Lane, but this does not over-ride the rural nature of the village. Many properties within the core of the village have extensive areas of garden and mature trees which help it to integrate with its rural setting. There are three important public open spaces within the village - the Recreation Ground, the Sheep Wash and the footbridge at the end of Green Meadow Lane. The Recreation Ground on Barrow Hill provides a break in the linear development of housing rising up the hill and attracts young children to the well equipped playground and sports people to the football pitch. The facility it important in providing a focus for the younger generation of the village for whom the nearest leisure centre is in Andover. The Sheep Wash is the gem at the centre of the village giving access to the river and space for picnics and family enjoyment. It links to the Village Club and the Tennis Club courts which together form a very important amenity and focal point for village life as well as providing a very attractive open space at the heart of the community. The footbridge over the river where Green Meadow Lane joins the Village Street is an idyllic location providing a peaceful setting with the opportunity to view wildlife. The surrounding countryside, although mostly arable farmland, is studded with many tree plantations and copses with oak, ash and beech being the predominant native species. These wooded areas provide valuable shelter and habitat for a wide variety of wildlife. ​At the river bank, grey poplars, willows and alders are in the majority with, in contrast, some swamp cypress trees planted in the vicinity of the village centre and the Sheep Wash.
​The Anton and adjoining water meadows are home to large numbers of native river birds which are joined by other migratory species during the year. Those with time to quietly explore the river valley may he rewarded with the sight of rarer species such as little grebe and water rail. Shy water voles will also be seen. The village has an extensive network of bridleways and footpaths. These enable villagers and visiting walkers to move around the village and the full extent of the parish from Clatford Oakcuts in the west to Cowdown in the east. This can be done with a minimum need to walk on roads and enables pedestrians to enjoy unspoilt views of the village and the surrounding countryside. ​The footpaths traversing higher ground above the golf course provide rewarding views to the west. The areas of trees both in and around the village provide valuable shelter against wind and help maintain the tranquil setting by filtering out the sounds of traffic from the A3057 and A303. The absence of street lighting minimises the amount of light pollution emanating from the village at night, maintaining its unobtrusiveness in the landscape. The peaceful setting of the village is assisted by the absence of through traffic. Future development should be considered in the light of the landscape setting particularly the open countryside surrounding the village and separation from Upper Clatford and Andover. New buildings ​should be sited to maintain the hidden characteristic of the village.